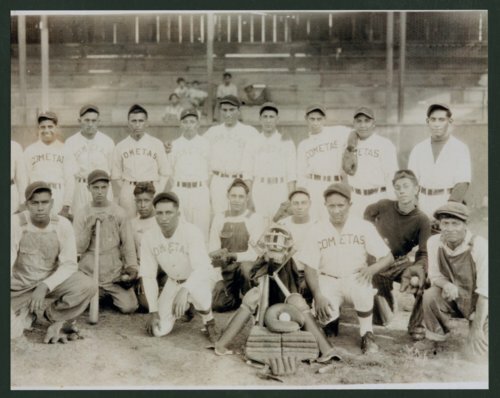 This is a photograph of the Cometas, a Mexican-American baseball team in Topeka, Kansas. People in the photograph are identified as (left to right): Estaban Guerrero, Hilario Tostado, unknown, Joe Perez, John Lira, John M. Tinoco, Lupe Cabrera, ___ Rodriguez, Jose Lopez (manager), and second row: unknown, Benino Dominquez, Luciano Gutierrez, Ramon Aguirre, Ramon Alcala, Jesue Rodriguez, Thomas Lopez, Manuel Reyes or Mendez, Joe Lopez, and Jesus Sanchez. The team played in City and Ripley Parks. Digital reproduction of the photograph was accomplished through a joint project sponsored by the Kansas Historical Society and the Shawnee County Baseball Hall of Fame.